Welcome to Country Kids. Country Kids was one of the first linkies I joined in when I started my blog four years ago. It helped inspire me to enjoy so many outdoor adventures with my girls and create happy memories. It is an honour to be taking over hosting Country Kids from Fiona at Coombe Mill who has hosted it for the last seven years, along with my co-hosts Helena from The Queen of Collage and Lucy from Kids of the Wild. We recently returned to one of our favourite places, Chiltern Open Air Museum, for the first time this year. 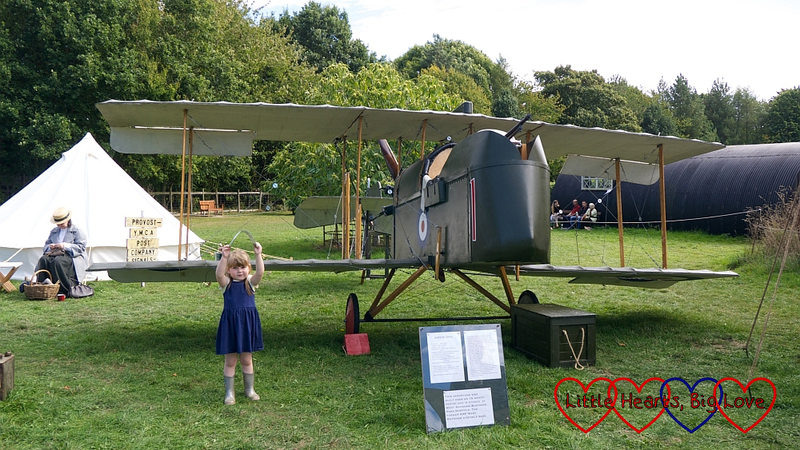 I enjoyed learning a little more about World War 1 as part of their themed weekend and Sophie had fun revisiting some of her favourite spots. Everyone else who linked up was next with 5 comments each. Thank you to everyone who joined in last week and for the comments you took time to leave. We’ve had another week with everyone sharing the blog love. Thank you all for helping to keep Country Kids such a supportive community. I loved Typical Mummy’s post about creating clay faces on trees. This is such a fun outdoor activity and one I keep meaning to do with Sophie at some point. Helena’s favourite post was from Herne Hill Mummy, sharing some adventures under canvas on the first leg of their European roadtrip. Lucy’s pick was Over 40 and a Mum to One’s post sharing their steam train adventures on the Severn Valley Railway.